The festive offerings from Heston keep on coming and being a bit behind the curve I’m writing about them as the season has passed. This either means nobody will read the blog because, apart from debt collectors and credit card companies, nobody cares about Christmas in the early part of January, or lots of people will read it as they seek to keep the festive spirit alive a bit longer. I suspect the former will be the case, but as I’ve got the products and have taken the photos I’m going to persevere. If you have ever tried a Heston product that lists Earl Grey as a headline ingredient, or indeed if you have read one of my blogs on the topic (see here or here) you will know that the Earl Grey flavour in an Earl Grey product is often lacking. So I was prepared for an Earl Grey free zone when it came to this stollen. The Heston quote on the box reads “This festive seasonal stollen is brought bang up to date by using buttery brioche dough, adding my special mincemeat, infusing the flavour of Earl Grey tea and finishing with a light dusting of tangerine-flavoured sugar” this all sounds very positive to me and I was won over at “buttery brioche dough”. I slid the stollen out of the box and it looked much like any other stollen I’ve ever seen, however this one felt incredibly soft with a moist bottom. I cut into it to discover a generous supply of plump fruit well distributed throughout the dough. 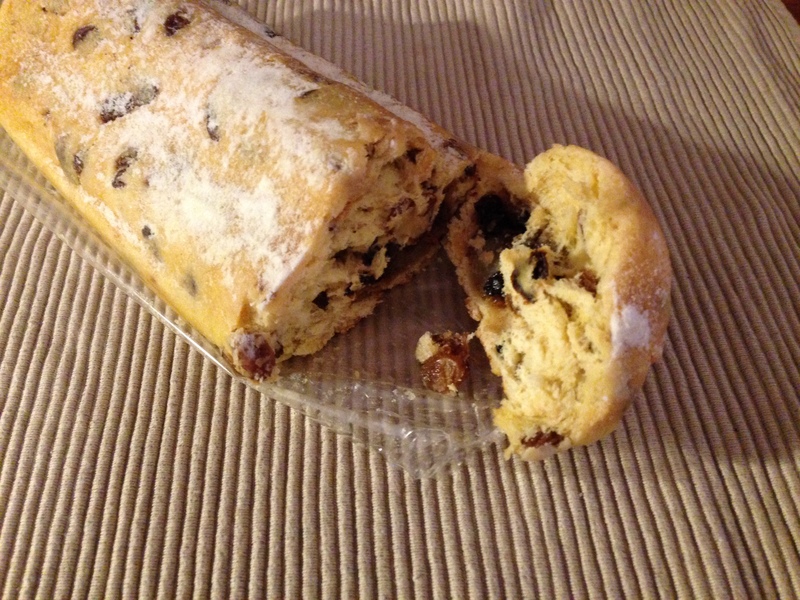 I took a bite and experienced one of the most delicious examples of a stollen I’ve ever had the pleasure to ingest. The dough was sweet and soft the fruit plentiful and full of flavour and the tangerine sugar was a great yet subtle addition. Was there a discernible hit of Earl Grey? Of course there wasn’t, but that is no surprise and I don’t really mind. I’m sure Earl Grey played a part somewhere along the line to make the overall product taste so good, my only quibble really is that you shouldn’t call it an Earl Grey Tea Stollen when the part Earl Grey plays is so minor. Looking at the ingredients it could just as easily be called diglycerides of fatty acids stollen, but that is far less catchy. I don’t profess to be any sort of expert, but my previous encounters with this German confection have all been bordering on the dry side. I’ve never had a problem with this as I’ve assumed it to be the norm, but to taste one that is so moist, soft and delectable is a real treat. Perhaps for traditionalists this stollen is a travesty, or perhaps it’s the first time I’ve tried a really good one – either way I’m happy. If they still have them in stock grab one while you can, if they don’t then it’s certainly something to look forward to for Christmas 2014! 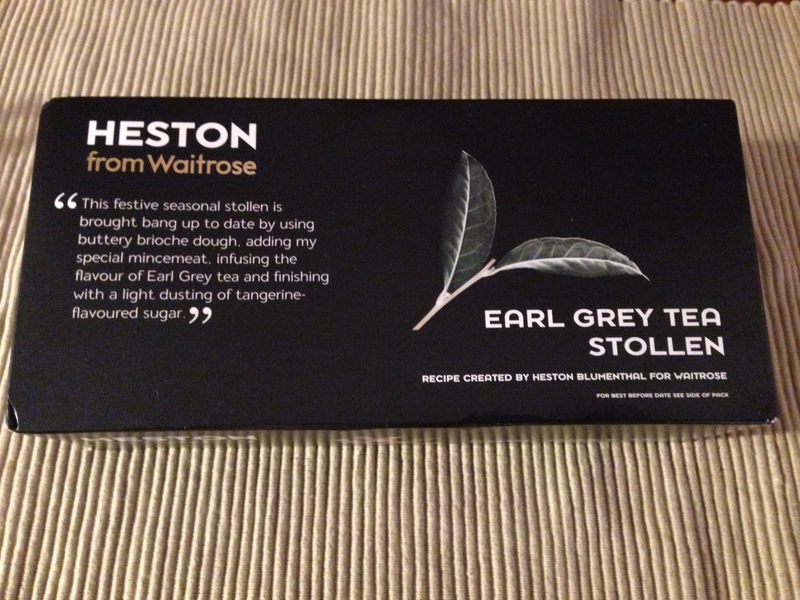 This entry was posted in Uncategorized and tagged Earl Grey, Festive, Heston, Stollen, Waitrose. Bookmark the permalink. Thank you for your lovely comment and for reading my nonsense! I feel very proud that I not only provided a topic of conversation, but also influenced a Waitrose staff members buying products. I’m so pleased you got to try this out, and I’m even more pleased it didn’t have a discernible Earl Grey flavour. That could have spoiled the thrust of your review which, lets face it, is the primary reason this product was launched. I reckon the Heston from Waitrose stuff is a lot more hits than misses these days. We got one of these to make a Christmas pain perdu, topped with the Christmas Pudding Ice Cream from the same range. It was so soft and moist the stollen nearly disintegrated on the way to the pan. I actually contemplated infusing an earl grey tea bag into the pain perdu milk, anticipating there’d be a lack of the headline flavour. It was left out in the end. Quite surprised you didn’t detect the Earl Grey flavour, I definitely got it one mine. I actually thought it was the more prominent flavour, before then giving way to the spiced mincemeat. I also thought using brioche was a master-stroke, it really does it elevate it from a standard stollen to something an another gastronomic plain. I came across your blog as I desperately scour the internet to see if anywhere still has some left! It really was incredible!